Dobsons Bridge No 55 is a minor waterways place minor waterways place place on the waterways major waterways place village town city on the Lancaster Canal (Main Line) between Ribble Link - Lancaster Canal Junction (13 miles and 5 furlongs to the south) and Lodge Hill Junction (Junction with Lancaster Canal - Glasson Dock Branch) (8 miles and 7¾ furlongs to the northwest). 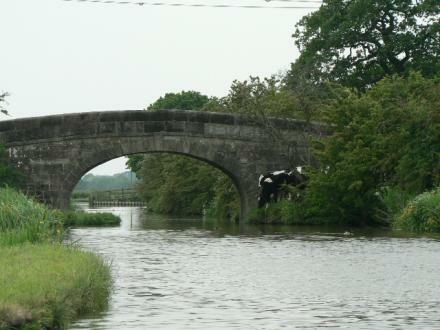 The nearest place in the direction of Ribble Link - Lancaster Canal Junction is Ray Lane Bridge No 54; 2½ furlongs away. The nearest place in the direction of Lodge Hill Junction is Bowgreave Field Bridge No 56; 2¾ furlongs away. Catterall — 1367 yards to the southwest. 9 Garstang Road, Preston, PR3 1PE — 1255 yards to the west. Garstang, PR3 6BD — 1440 yards to the northwest. Bowgreave Drive, Garstang, Preston, PR3 1YE — 1182 yards to the west. Castle Lane, Preston, PR3 1RB — 1288 yards to the northwest. 61 Lancaster Road, Garstang, PR3 1JD — 1440 yards to the northwest. Preston — 1229 yards to the west. Garstang By Pass, Catterall, PR30HL — 1530 yards to the southwest. Preston — 1467 yards to the southwest. 11 Catterall Gates Lane, PR3 1YH — 1586 yards to the southwest. Garstang — 1440 yards to the northwest. Preston — 1586 yards to the west. Lancaster New Road, Garstang, PR3 1WL — 1440 yards to the northwest. Unit 3, Area A, Creamery Industrial Estate, Kenlis Road, Barnacre, Garstang, Garstang, PR3 1GD — 264 yards to the east. 40 Garstang Road Bowgreave, Garstang, PR3 1YE — 1200 yards to the west. 122 Garstang Road, Preston, PR3 1XN — 1584 yards to the southwest. Catterall Village Hall, Catterall, PR3 1XN — 1582 yards to the southwest.